Essay Writing Prompt: Ernst Schnabel wrote of Anne Frank, “Her voice was preserved, out of the millions that were silenced…[She] has outlasted the shouts of the murderers and has soared above the voices of time” (110). The same could be said of Night author, Elie Wiesel. For those that experienced the Holocaust, why was it so important for them to tell their stories? How has the Holocaust affected the identity of the Jewish people? In a well-developed essay, discuss the effects of the Holocaust and the importance of the survivors bearing witness by telling their stories. 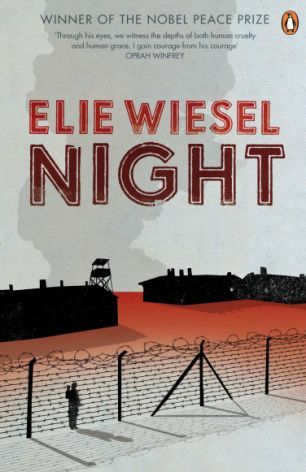 Cite textual evidence from Elie Wiesel’s autobiographical novel, Night, Art Spiegelman’s memoir, Maus, and at least one other Holocaust text to support of your ideas. This entry was posted in 10th Grade English and tagged art spiegelman, boy with the striped pajamas, elie wiesel, Hitler, holocaust, Jews, life is beautiful, maus, nazis, night, recurring theme, response to literature by Anthony Nittle. Bookmark the permalink.